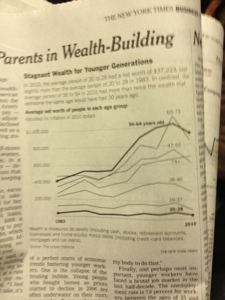 I found this chart fascinating-- so much so that I had to take a shaky pic of it on the subway with my phone! Why did older people's wealth skyrocket then while others were stagnant? Per the caption of the chart: Wealth is measured as assets (including cash, stocks, retirement accounts, businesses and home equity) minus debts (including credit-card balances, mortgages and car loans). Younger people are likely to have less assets and more debts. As you get older, The sharper rise in the 55-64 yr group appears to coincide with the boom of the '90s when housing values were high, the market values for retirement accounts were high, but not yet being tapped, and earnings typically are at their highest. I think the graph trends suddenly up for each age group 38+ due to a rising stock market. It goes up more based on how much each age group had to invest. The older you are, the more you had saved at that time (on average) so the more you benefit from the rise. Oh, Madame X -- that's easy! As people age, their financial advisors move them from equities to bonds. As interest rates have dropped, bonds have done very well. Well I had thoroughly enjoyed your blog but now that you have moved in with "hubby to be" your fans only get 1 posting a month if that. Time to move down, you might as well shut down the site now.